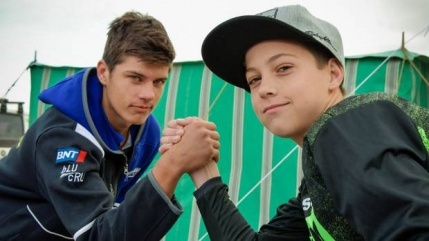 FIM Oceania Challenge Cup rivals Whanganui's James Rountree (left) and Australian Brad West, have fun as they mock up an arm wrestle before the weekend's racing began. There was much more to the weekend's 58th annual New Zealand Motocross Grand Prix at Woodville than met the eye. In addition to its unrivalled status as New Zealand's largest stand-alone motocross event, the Honda-sponsored two-day event was again this year hosting the FIM Oceania Challenge Cup competition. The Oceania battles see-sawed over the two days, with Australia's squad ending the junior phase of racing on Saturday with a slender 2.5-point advantage. This was mostly thanks to Australia's Brad West winning all three of his Junior 14-16 years' 250cc races, while New Zealand's FIM Oceania representative, Whanganui's James Rountree, finished runner-up each time. Weather conspired against the organisers on Sunday, with rain and gale-force winds causing havoc on the track, and a decision was made to scale back the day's programme to just two races for each class. In the end, the event's main winner was Mount Maunganui's Cody Cooper, the six-time former national MX1 champion winning both the premier MX1 races in Sunday's abbreviated senior programme, earning him the prestigious Woodville crown, but, for the FIM Oceania Challenge Cup sub-plot, it was a slightly different story. On both occasions the runner-up to Cooper in the MX1 class on Sunday was Gold Coast rider Kirk Gibbs, Australia's MX1 class nominee for the FIM Oceania Challenge Cup battle-within-a-battle. Cooper had earned 50 points from his two wins, while Gibbs — actually the current New Zealand MX1 champion — had a tally of 44 points for the weekend. Australian Wilson Todd finished first and third in his two MX2 (senior 250cc) class races, while the Kiwi hopes for MX2 class ascendancy rested with Mangakino's Maximus Purvis, who crossed the finish line fourth and then second. "It was really cool to win this and our juniors really pulled their weight," said Australian MX1 star Gibbs. "Heading into the senior day, Australia was up in the points and then Wilson (Todd) did really well and I was consistent. It was really close and good to bring it home. We really enjoyed the banter with the Kiwis too."